Though the arms are all differenced, they each bear the crest blazoned in Fairbairn's Crests as: In a hand an antique shield sable charged with a mullet argent (all three windows, however, show the mullet as or), and the first two have the same motto (the third has no motto in the window at all): Adversa virtute repello (I repel adversity with fortitude) (which sounds to me more than a bit like a spell that might be cast in Harry Potter. But maybe that's just me). Robert Dennistoun, merchant, was the son of James Dennistoun (d. 1796) , one of the leading American merchants, and during the latter part of his life resided in Glasgow, and his second wife, Mary Lyon. Robert married Anne Penelope Campbell, a daughter of Archibald Campbell of Jura, and they were the parents of James Robert Dennistoun ('Ruffy'; he got this nickname from his wearing a fringe or “ruff” of beard under his chin), and grandparents of Admiral Peel Dennistoun. Robert was a partner in George & Robert Dennistoun & Co. of Glasgow until his death c. 1815. The firm of G & R Dennistoun is known to have been the mortgagees-in-possession of Wingfield and Belle Vue estates on St. Kitts in 1825. He was one of the prime movers behind the formation of the Glasgow West India Association in 1807. Robert Dennistoun's arms are blazoned: Argent and bend sable between a unicorn's head erased gules horned or and a cross crosslet fitchy gules, on a canton argent a demi-lion azure. His wife's paternal arms are blazoned: Quarterly: 1 and 4, Gyronny of eight sable and or [should be or and sable]; 2, Azure a boar's head couped or; 3, Argent a lymphad oars in action sable. coat of arms from that window. I believe the current window has Mr. Dennistoun's date of death incorrect; all the records that I found on-line for him give a death date of 1855. I suspect that the date was worn in the original, and that the 5 became an 8 in error. 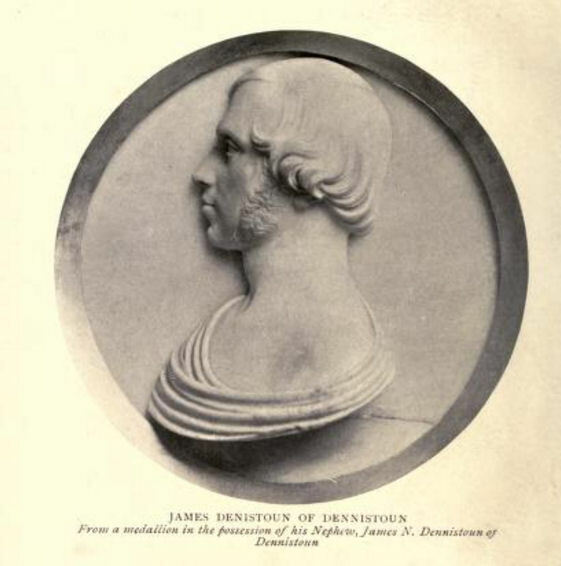 James Dennistoun of Dennistoun (1803-1855) was the son of James Dennistoun and Mary Ramsay Oswald. He received his education at the universities of Edinburgh and Glasgow, and became a member of the Faculty of Advocates in 1824. 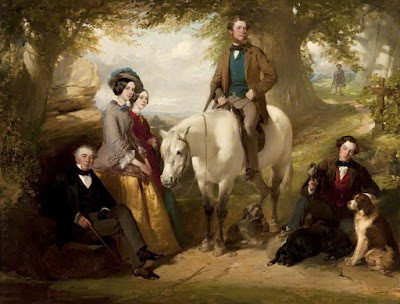 Having traveled abroad in 1825-26, in 1836 he again went abroad, and spent twelve years away from home, chiefly devoting himself to literary research and art. The winter generally found him at Rome, while the summers were given to journeys in Italy and Germany. He formed a collection of early Italian pictures, drawings, and medieval antiquities, with which he adorned his house in George Street, Edinburgh, his permanent home from 1847. He was a magistrate and deputy-lieutenant for the county of Renfrew, and became a member of most of the societies formed for collecting materials for illustrating the history of Scotland. His wife was Isabella Katherine Murray (1808-1864) was the daughter of James Wolfe Murray of Cringletie, Lord Cringletie, and Isabella Katherine Strange. James Dennistoun of Dennistoun's arms are blazoned: Argent a bend sable. His wife's paternal arms are blazoned, I believe: Or a fetterlock and on a chief azure three mullets argent. incorporates the coat of arms from that window. The arms of Dennistoun of Golfhill were matriculated in 1865 and are blazoned: Per fess argent and ermine a bend sable between a unicorn's head erased and a cross crosslet fitchy gules. These windows are all found in St. Kentigern's/St. Mungo's Cathedral, Glasgow, Scotland.